If you find yourself adjusting things in System Preferences often enough, it’s helpful to create a universal keyboard shortcut to quickly launch into the control panels on the Mac. It’s important to select a keyboard shortcut that won’t interfere with other actions or apps, as far as I can tell nothing else reserves Control+Command+Comma and so it works perfectly for this purpose. 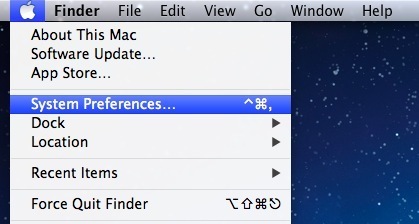 Once set, you’ll notice the keyboard shortcut is now attached to the System Preferences item within the  Apple menu. Without setting anything extra, you can also launch directly into select System Preference panels by using Option and the various function keys like Audio and Brightness. This helpful tip comes by way of one of our readers, Esaruoho. Dont forget to enter the … periods or it won’t work. Good tip, but FYI: That keyboard combination does conflict with SpellCatcherX. I opened the keyboard shortcut area and tried to enter the shortcut as stated, however it will not let me enter anything…I tried to put in the ^ symbol for “control” but it just beeps back at me. am I doing something wrong? Thanks a ton man !!! I’ve been looking for this for so long…finally found it !! !